Do you want to change the color of your car body shell? You may worrying about how to paint your car now. Today we will offer you a choice to spray color on your car body shell. Hard Body Shell Kit can totally meet the need of you, you can spray color what you prefer on your car and assemble a new car by yourself. Cool, a new different journey is waiting for you. Warm notice: This is DIY kit, you can assemble them by yourself, and buy what you like most lacquer to spray your car. Made of ABS material, exquisite workmanship and excellent performance for durability. This is a DIY version, it will bring you more fun and build up your manipulative ability. 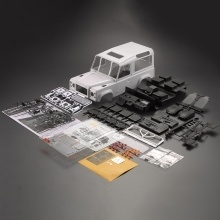 This Hard Body Shell Kit is designed for 1/10 280mm Land Rover Defender 90 RC Car. You can spray color what you prefer on your car body shell, which is different from others. This car body shell is the latest product, every detail is well-designed, it really worth for you to choose. Note: There could be a few deviation due to manual measurement.